"Tonight I'll eat supper in Baltimore -- or in Hell," declared British Major General Robert Ross. He had every reason to expect success for his attack on the third largest city in the United States during the conflict known to history as the War of 1812. By September 12, 1814, America was fighting for her life. The British had defeated Napoleon and exiled him to Elba. They transferred masses of seasoned troops including "Wellington's Invincibles", the soldiers who beat Napoleon, to the American front. 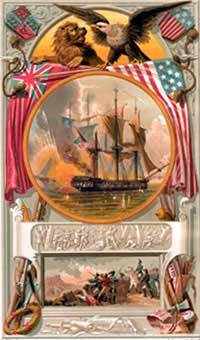 Despite a few impressive victories at sea, America was losing the war. Detroit, Chicago, much of Maine and northern New York state were occupied by the British. Indian tribes, supplied with British arms, raged on the western frontiers. The enemy navy had turned the Chesapeake Bay into a British lake. And, in August 1814, General Ross had captured Washington D.C.
President James Madison ordered the evacuation of the Nation's Capital. His courageous wife, Dolly, whisked away some of the portraits and best furniture from the White House. General Ross and Sir George Cockburn set Washington ablaze. They burned the White House, the Capital, and many other buildings. Ross boasted that he rode his white horse away from the burning city with his pockets stuffed "full of old Madison's love letters." General Ross had other reasons to expect he could take Baltimore, which was both larger and more economically important then Washington. For one thing, some of the New England states, with Massachusetts as the leader, were forming a popular plan to secede from the United States and sue for a separate peace with England. The war was that unpopular with those whose livelihood depended on trade. Another factor was superior British weaponry. The English expeditionary force which occupied the Chesapeake bay, besides troop transports and supply ships, included 16 warships. Among these were several bomb-ketches. Naval historian, C.S. Forester, describes bomb-ketches as having an "enormous mainmast which had to make up in the amount of canvas it carried for the absence of a foremast. The mizzenmast, stepped far aft, was better proportioned to the diminutive vessel ... On either side of her midline were the two huger mortars... bedded upon a solid mass of oak against her keelson.
" Mortar fire from a bomb-vessel was the uttermost refinement of naval gunnery, brought to a high degree of perfection. The high trajectory and the low muzzle velocity of the projectile, and the avoidance of the disturbing factor of irregularities in the bore of the gun, made it possible to drop the shell with amazing accuracy." Forester says that the mortars were like big cauldrons in the eyes of the bomb-ketch. They used powder made up in cartridges of a pound, half a pound, and quarter of a pound. A midshipman tore open a cartridge of each size and poured the contents into the mortar, and pressed it home with an enormous wad of felt. "Each explosive shell had its own fuse which had to be cut and lit separately from the propelling charge. If the bomb's fuse was too long, some brave soul might extinguish it on the ground; if the fuse was cut too short, the bomb would burst in air before it reached the target". The curve of the thirteen-inch shell, with the fuse protruding was just level with the rim of the muzzle, says Forester. The gunnery officer "took hold of the smoldering linstock, and applied it to the fuse of the shell... he left himself a five-second margin in case the fuse burnt unsatisfactorily and had to be relit... then he pressed the linstock into the touch hole of the mortar and it went of with a roar.. (He) could see the shell rise, its course marked by the spark of the burning fuse. Up and up it went higher and higher, and then it disappeared as it began its downward flight at right angles to the line of sight." Not only could Major General Ross depend on his mortars and other superior weaponry, but he had also formulated an excellent plan of attack. On the morning of September 12th, when he made his boast about supper in baltimore or in Hell, he disembarked with 5,000 battle-hardened troops on North Point to draw the city's American defenders in that direction. The fleet began a naval bombardment from the east and a second British landing force landed south of the city and moved north. Maryland Senator Samuel Smith, a general in the militia , marshaled the city's defenses. One of his riflemen shot General Ross off his white horse. The general did not eat supper in Baltimore that night. On Ross's death, Col. Arthur Brooke took command of the British forces. The defenders dug entrenchments north and south of the city, and they sank some old ships in the middle of the channel to keep the British warships from approaching too close. Fort McHenry guarded the entrance to Baltimore's harbor. Major George Armistead commanded the regular American garrison of about 100 soldiers inside the fort. 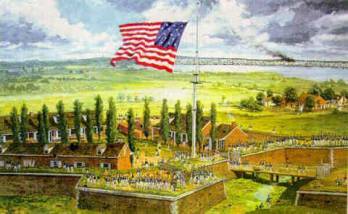 Major Armistead, in anticipation of the British attack, prepared an oversized 15-star, 15-stripe American battle flag to fly over the ramparts of the brick star-shaped fort. Because the field cannons in the fort were too light to reach the British ships -- which anchored miles away -- there was little Armistead and his men could do but defy the enemy and endure. 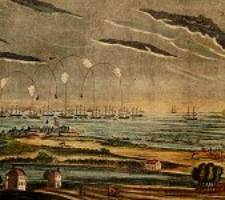 Beginning at dawn on September 13th, the bombardment of Fort McHenry commenced. For 25 hours, the Americans endured and endured and endured. On a small sloop anchored behind the British fleet, an American lawyer, Francis Scott Key anxiously watched the battle. He had sailed out to the enemy fleet two weeks earlier to negotiate a prisoner-of-war release for Dr. William Beanes. The doctor had been captured by the British soldiers as they withdrew from burning Washington. The English agreed to release Dr. Beanes, but would not let the Americans return to shore until after the battle for Baltimore. Key, Beanes, and Col. John S. Skinner, the U.S. Cartel agent, watched the enemy's bomb-ketches lob shells down on the fort. They tracked the trajectory of the bombs by following the trail of sparks sputtering from the burning fuses. Occasionally, a puff of smoke from the fort showed that the defenders were returning the fire, but a splash in the water revealed that the defenders' shells fell short. The three Americans felt frustrated and helpless seeing this assault on their country. They stayed on deck all night and saw more of the pyrotechnic display of war. 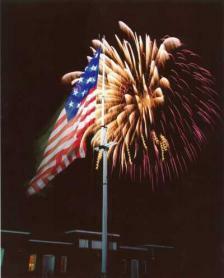 And occasionally they saw a glimpse of the oversized flag still waving defiantly over the fort. Shortly after midnight on the 14th, the guns ominously, suddenly, fell silent. Did this mean the fort had fallen? No, the British were trying a two-pronged landing south of the fort and didn't wish to bomb their own men. American soldiers beat both prongs of the British land assault back into the sea. The three Americans in the sloop had no way of knowing the outcome of the battle until the dawn's early light showed through the mist and drizzle that the American flag still flapped in the sea breeze above the fort. Col. Skinner persuaded Key to take the poem to the newspaper office of the Baltimore American. 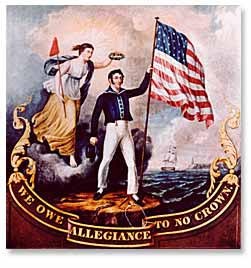 Before the English warships had cleared the Chesapeake waters, people were singing the new anthem in the streets. The music was adopted from an old English trumpet march. 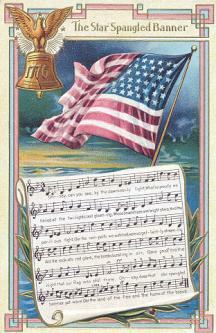 The melody was already popular before Key wrote new words, and it was often played on patriotic occasions, such as Washington's Birthday and the Fourth of July. The tune first appeared in 1775 as the song of the Anacreonic Society, an organization of wealthy music lovers. It was called TO ACACREON IN HEAVEN. In 1931 President Hoover signed Public Law 823 making this song our official National Anthem. 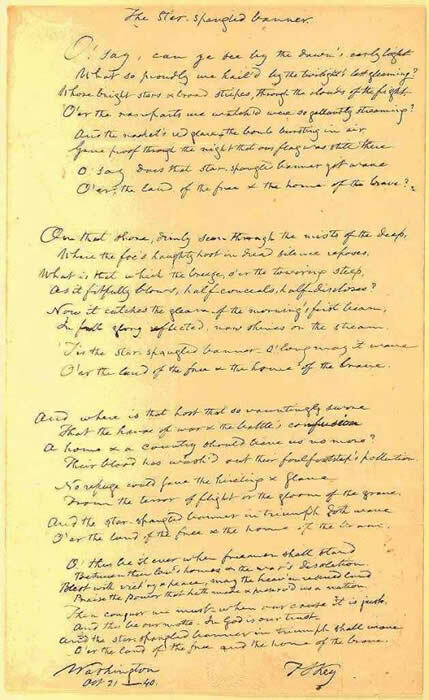 When Francis Scott Key was asked about his song, he said it was the result of seeing the flag: "With it came an inspiration not to be resisted; and even though it had been a hanging matter to make a song, I must have written it... Does not such a country and such defenders of their country deserve a song?" 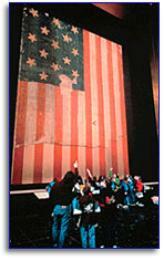 Fort McHenry's Flag is now in the Smithsonian.